Completely accurate, up-to-the-minute MLS searches at prairiecrossinghomes.com. The links are above in the menu bar. Recent changes in MLS content usage rights have changed the accuracy of MLS searches on websites such as Trulia and RedFin. Our searches are absolutely accurate because we are paid subscribers to the MLS and we pay additional fees to offer the search tools to you. We help you search the MLS for free and there is no registration required! Simple hassle-free real estate searching is service we provide to support Prairie Crossing residents as full-service real estate professionals. If you are considering buying or selling in Prairie Crossing we would appreciate the opportunity to discuss the high level of service we can provide you. Victoria Carton has been a positive welcoming presence in the Prairie Crossing for over 10 years. Since 2008, Victoria Carton’s Team has been involved in over 75 Prairie Crossing home sales and 25 Prairie Crossing rentals. Victoria is in constant contact with homeowners who have questions about the current market conditions or home valuation. She strives to maximize property valuations and promote the values and conservative nature of the Prairie Crossing community. Her active involvement with local organizations such as The Grayslake Rotary Club, help keep the Prairie Crossing reputation for quality living and environmental sensitivity in the forefront for business leaders in our community. For those interested in purchasing in Prairie Crossing, this website is the first stop for many buyers. The extremely high level of accurate and complete information about the Prairie Crossing community can be found nowhere else on the web. Our exposure to the market is extraordinary and we spend a great deal of time keeping this website current. Due to the substantial amount of visitor traffic prairiecrsossinghomes.com receives, we are constantly contacted by interested home buyers. We are delighted to answer the dozens of phone calls and emails which we receive every week. If you are considering selling your home, or if you are buyers looking to purchase in Prairie Crossing, you can rely the Carton Teams’ deep and an up-to-the-minute understanding of the Prairie Crossing market. 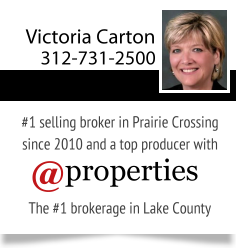 Victoria Carton has been involved in 75+ Prairie Crossing home sales and 25+ PC rentals over the past 10 years. Prairiecrossinghomes.com is a commitment to enhancing the Prairie Crossing market. Being as popular as it is, this website keeps Victoria in constant contact with potential home buyers as well as Prairie Crossing homeowners. If you are considering purchasing a home in Prairie Crossing or are considering the sale of your Prairie Crossing home, choosing a real estate team with extensive Prairie Crossing experience will help you make great decisions.